Last I checked, 49.5% plus 41.3% does NOT equal 100%. I know exactly what is happening. I trot in after a wipe, we pull the boss, I’m healing away, I go to use Holy Word and discover it no worky. Why does it tell me that my target is invalid? Why there no targeting circle? Oh right, no Chakra. Now, I had a weenie little power aura, but I could ignore it too easily. So here’s my new power aura, which triggers whenever I enter combat without a chakra state on. The key I’ve found about reminder auras is that you will start to ignore them if they are visible often and you have no reason to respond to them. For me, there’s no reason not to have a seal so that aura appears even in town. Crusader Aura, however, has a few legitimate combat uses. So I either disable the “you noob” notifier, or I program around certain fights. If there’s no reason to not have a state active, then I’d suggest making the aura big and obstructive and constantly visible. I’d rather spend a GCD before hitting the AH than wasting a cast on the boss pull. Fortunately, Chakra doesn’t cost a GCD. It can be macroed with the appropriate heal. So it’s not a HUGE deal to enter combat without it on, since it can be corrected within the first few casts. However, it is much better to just have it ON before the pull. The reason NOT to have it active at all times? It’s because when you’re in town and those damn chakra floating circles are around the priest’s feet and it’s really distracting and annoying. 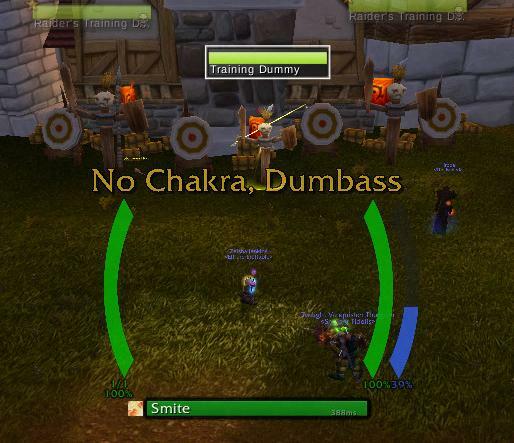 Chakra floating rings are for combat!